I’ve never understood this bittersweet narcissism within myself. I love to wander lonely streets in unknown cities. To find a cafe and order a coffee and think to myself — here I am, known to no one, drinking my coffee and reading my paper. To sit somewhere just barely out of the rain, and declare that my fortress. I think of myself in the third person: Who is he? What is his mystery? I have explained before how I’m attracted to anonymous formica restaurants where I can read my book and look forward to rice pudding for desert. To leave that warm place and enter the dark city is a strange pleasure. Nostalgia perhaps. The internet has a strange sense of death. There is a rush for immediacy, for action, for content of all kinds. Functionally, it’s like that unknown city, rush and bustle and bother and noise noise noise. Especially noise. There’s noise of colour and noise of words, noise of image and noise of news, noise of opinion and noise of importance. Anything less than the loud alarum clamour of constant updates is seen as death. Or at least terminal illness. 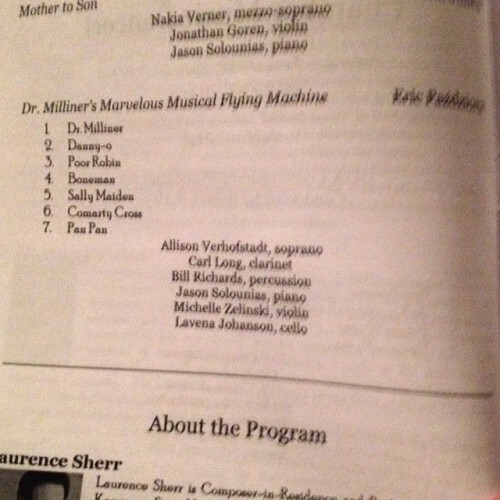 …the good people at the New Voices @ CUA music festival are performing an odd chamber piece composed by my brother Eric, called Dr. Milliner’s Marvellous Musical Flying Machine. It’s a song cycle, sort of, and the words are an oddment of nursery rhymes that I wrote myself. This was an absurdly fun and somewhat silly collaboration between the two of us, just over a year ago now, and I’m delighted that it was selected for the festival, and that folks in Washington DC, even as I’m writing this, being surprised by the rather odd thing we concocted. Farewell to the Year of the Unlucky Number–which paradoxically was a heck of a lot better for me than 2012 ever was, so make of that what you will. And to you all, a very belated Chanukah, a mid-stream Merry Christmas (day 7 of 12), and a really rather early Happy New Year 2015. If you’ve wondered where I’ve been—well, I’ve been sick, honestly. And writing scintillating, sparkling, wonderful blog posts was beyond me as I huddled around, feeling rubbish. As was writing dull, grumpy, turgid, uninteresting blog posts, for that matter. In the course of the past several days and weeks, perhaps you have had occasion to stop and wonder, ‘That Mr Pond—just where is he?’ Well, I can lift that worry right of your backs, by telling you the answer. I’ve been writing and publishing, mostly. Sister Fox’s Field Guide to the Writing Life, by Jane Yolen, was made available for pre-order this week over at Unsettling Wonder. I’m very proud of the work we’ve done on this book. It’s a new collection of Jane’s mythic arts poetry, and is as wonderful and moving and provoking and beautiful as that suggests. You can find more about it here. T he embookenation of this blog is now complete in manuscript, and has been sent to the publishers. Its working title is A Land of Giants: Growing Up with Fairy Tales, Dragons, and Harry Potter. Not sure how long production will take, but I’ll give your periodic updates as the process goes. I’ve had a lot of fun working with Unlocking Press in the past, and so will be looking forward to this process. I just wrote a post for Unsettling Wonder that featured Jane Yolen’s comment on my previous blog post here. If that sounds convoluted here’s the link that explains everything. It has more of my thoughts about mythic arts in. 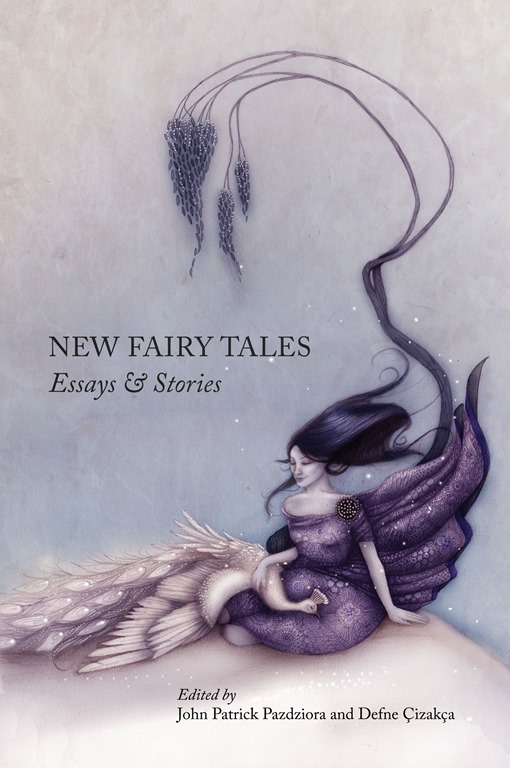 And, more importantly, features Jane Yolen being insightful and eloquent. So you probably want to go read that. But before you go, let me bid you l’shanah tovah and give you warmest wishes and every blessing for the New Year. And speaking of people being eloquent, here’s Barack Obama offering his own good wishes for the holiday and the year ahead. Well worth your while watching this. I can’t help but notice that the president looks nearly as exhausted as Neil Gaiman at the end of a signing tour. But it’s a beautiful speech for all that—a much needed and very welcome message of hope.